GATLINBURG, Tenn. (CNS) — When Huntsville, Alabama, resident Patrick Eads prepared to take his family on a trip to the Great Smoky Mountain National Park last August, he made sure to pack necessary vacation items, which included the address to the nearest Catholic church. Eads and his wife, Rachael, made the 250-mile drive to Gatlinburg with their 1-year-old son to experience nature’s glory. Rachael, noticeably pregnant, eagerly joined her husband and son on the long hikes along the Appalachian Trail to find the best views of the mountains and said the majestic vistas, the sounds of the summer insects, the feel of the warm sun on her face and the scent of the wildflowers growing along their route, energized her. After a day of navigating the Smokies, Patrick was feeling the need for spiritual nourishment, so the lanky, bearded redhead packed up his family and headed to St. Mary’s Catholic Church in Gatlinburg for the 7 p.m. Saturday Mass. A Google search before leaving home helped him locate the parish and he was thrilled that it was conveniently located near the town’s main strip. The Eads are among thousands of visitors who cross St. Mary’s threshold each year and they are a driving force in the 81-year-old parish, said Carmelite Father Antony Punnackal, pastor of the church. St. Mary’s can seat 525 people if the church staff opens up its parish hall and daily chapel, both of which can be exposed to the main altar. But, it’s not unusual for 800 people to attend a Mass during the peak park visiting times, Father Punnackal told Catholic News Service. People stand in the back, the side of the church and even stand outside when a Mass is really packed, he said. During the Aug. 14 Saturday evening Mass, the priest asked members of the large congregation to raise their hand if they were travelers visiting the park. A majority of the worshippers lifted their arms to signify that they were indeed visitors. St. Mary’s pastor calls them the “visiting parishioners,” because he considers them to be members of his church community, even if only for an evening. The parish is in solid financial shape because of the reliably generous support of the visitors, Father Punnackal told CNS. St. Mary’s Parish dates back to 1935 when a Knoxville couple donated a log cabin to become the first Catholic Church in Gatlinburg, then a little-known valley of English and Scotch-Irish settlers. Shortly after President Franklin D. Roosevelt dedicated the Great Smoky Mountains National Park in 1940, visitors to the area began overcrowding the 40-seat log chapel, prompting the parish to build its current church, which was completed in 1953 and later expanded to include a parish hall and rectory. When Willis and her husband, Ed, exited the church following the Aug. 14 Mass, they reminisced about how welcomed they felt by the priest and the other churchgoers. “The Catholic community is universal and that was on full display this evening,” Ed Willis told CNS. There was a comfort knowing that so many others in the church were also visitors and even the locals went out of their way to make them feel at home, he said. That is the sort of energy that keeps this parish thriving, both financially and spiritually, Father Punnackal said. 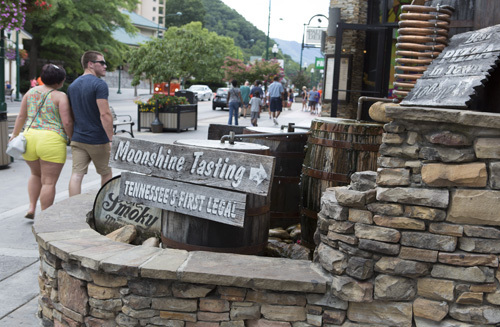 The city of Gatlinburg, with an estimated population of about 4,000, also benefits from the nearly 11 million visitors who travel to the Great Smoky Mountains annually, by far the most visited national park in the U.S. Complementing the picturesque streets are beautifully maintained early 20th-century structures, hanging baskets with colorful plants strung from lamp posts, and they were packed with cars and pedestrians on a summer afternoon. The main street leads to the entrance of the national park, where the Eads and Willis families, along with millions of others, are able to take in all of the gifts God has provided, Father Punnackal said.